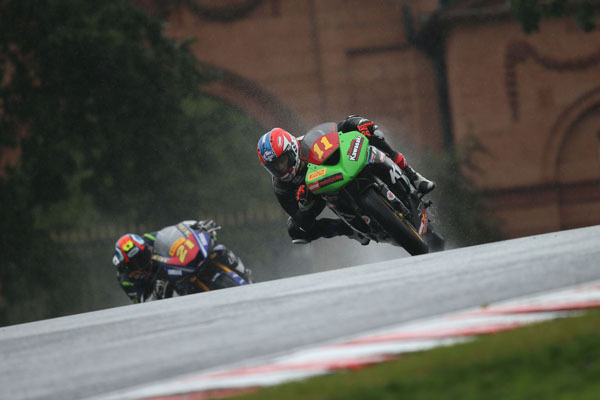 Rory Skinner put in another eye catching ride in a wet Pirelli National Superstock 600 race at Oulton Park in Cheshire today, once again fighting for the win with champion Ryan Vickers before sliding out three laps from home. The 16-year-old Scot, starting from second on the grid in his third wild-card appearance in the series, grabbed the holeshot on his Bennetts Tokheim Kirkcaldy Kawasaki ZX-6R to lead the opening laps from Vickers. The pair pulled away from the pack by over two seconds a lap as the rain got steadily harder. Rory led until lap seven, when he had to use all of his skill to avoid crashing when the rear end of his bike stepped out. That allowed Vickers to take the lead and although Rory looked to consolidate his position position, his race ended at the end of lap nine when he slid out after hitting a puddle at Lodge corner. Despite the disappointment of failing to score, Rory was upbeat about his performance, saying: “I got a good start and was able to pull a small gap on Ryan, but I had a moment at Knickerbrook, which allowed him to close up, and then another one that allowed him to get past. I tried to keep in touch but I was having more and more moments. It’s ironic because on the lap I crashed, I had made a decision to back off and settle for second. The rain was getting harder and I’d eased off a little bit, but I hit a patch of standing water in the braking zone for Lodge and there was nothing I could do. It hadn’t been there the lap before and when I hit it the front went down instantly. Rory is scheduled to make his final performance of the year on the Kirkcaldy Kawasaki at the Melville Motorcycle Club’s meeting at East Fortune next weekend, which incorporates the Scottish Formula 600 championship and the Steve Hislop memorial trophy.